Here’s a recipe I meant to put up all summer long, because summertime is burger time. But when you think about it, all the time is burger time! I like a hamburger or turkey burger as much as the next person, but I also love a salmon burger. They're so easy to prepare and everyone in our family adores them. Salmon is a very important food for kids because it's so high in protein, good fats and omega 3 fatty acids which aids in brain development. And did you know that a 4oz piece of salmon has a full day's requirement of vitamin D, one of the few foods that can make that claim. I made 8 medium sized burgers for a barbecue recently using this recipe and thinking I’d have leftovers. Nice try, before I knew it, every bite was gone. At least I know we all got our fill of vitamin D for the day! 1. Place the first 5 ingredients in a food processor and pulse until just combined (you should still see tiny pieces of salmon). 2. Form into patties and place on a sheet tray lined with foil or plastic wrap (mixture will be sticky. Using wet hands will make forming the patties much easier). 3. 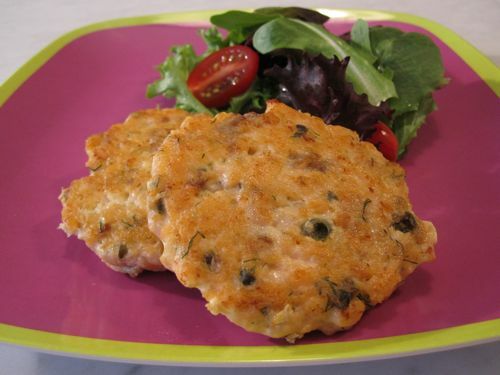 Cover and refrigerate the salmon patties for 1 hour. 4. Heat oil over medium/high heat in a large skillet. 5. Cook the patties for 3 minutes on each side. 6. Place on a bun and top with desired accompaniments. *After step 2, freeze for 30 minutes in the freezer then place them in a ziploc bag, label and freeze up to 4 months. When ready, defrost in fridge for 24 hours and follow steps 4-7.
yeah, I also had salmon patties, with cracker crumbs, eggs, and mustard for flavoring -- I still really like those. mmm, salmon. I just tried this recipe and it's great. Everyone loves it! We only use WILD salmon though becasue it's better for our kids. I'm also pregnant again so wild is the safe choice for me too. I'm really not a fan of capers. Do you have a suggestion for alternative to add more flavor? At wholefoods they had feta and red pepper salmon burgers. I guess you could really add anything, just make sure you have the egg so they stay together, right? I'm using frozen salmon and thawing it out, so I guess I could freeze them after I cook them? Thanks for such an awesome website. It has changed the way we eat and helped me budget and get organized. You are awesome Catherine! Feta and red pepper sounds delish! Yes, just make sure you use the egg. Freezing after forming the patties should work beautifully! I made this last night and it is awesome. Super easy and delicious.